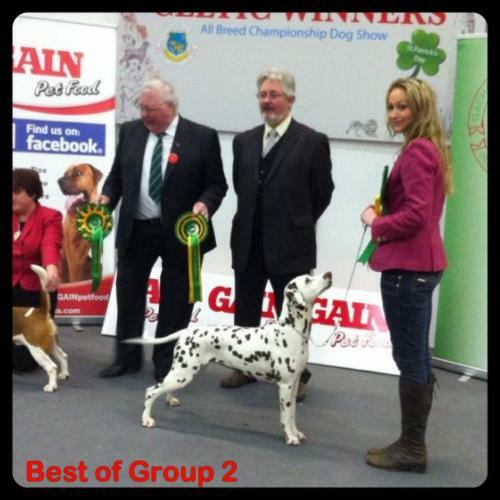 Diva is a multi champion in Europe and has won reserve CC's in the UK. She is bred & Owned by Helle Hoie and is temporarily co-owned with Alex Cobb-McGill while Diva resides in the UK for a period of time in 2013. The Kalokairie Kennel are very priviledged to have Diva come and stay from Norway, it is a big trust on Helle's part as Diva is her pride and joy. 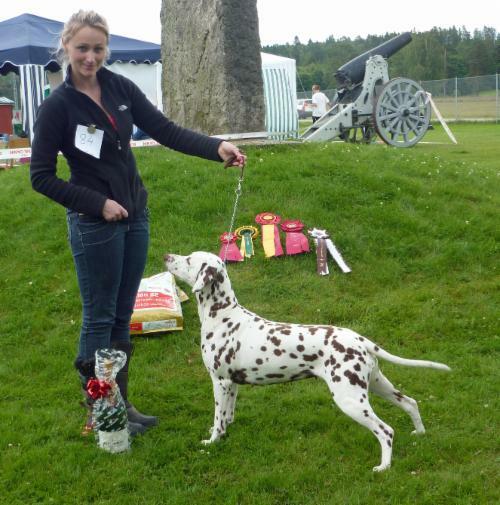 Alex was honoured by having the opportunity to handle Diva to BEST IN SHOW at the Swedish Jubilee Dalmatian Club Show from some amazing competitors. It is also a dream come true for Alex to work with Helle as she has admired her breedline, breeding practices and dedication for a long time. Her knowledge, advice and guidance is greatly appreciated. Diva has settled into Yorkshire life very well and is living indoors with our pets and is very fond of our little dachshund. Diva is a pleasure to live with and is one of those "once in a lifetime" dogs. She will be campaigned and will have a Kalokairie litter while in the UK, I cannot Thank Helle enough.